Looking for a delicious way to celebrate the Fourth? 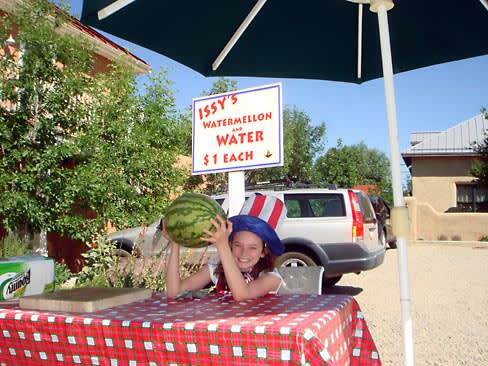 Head to Arroyo Seco, a charmingly quirky bend in the road between Taos and Taos Ski Valley. Seemingly, every one of the 1,000-plus residents of this Spanish land-grant community comes out to celebrate the birth of our nation with a pig roast and parade. open plain. Even for a regular visitor like me, the sweeping view toward the Sangre de Cristos and the ski valley inspires awe. It always makes the phrase “purple mountain majesties,” from “America the Beautiful,” pop into my mind. That’s extra-appropriate on the Fourth of July—Katharine Lee Bates was inspired by Rocky Mountain vistas when she wrote those words, and her poem first appeared in print on July 4, 1895. The view definitely has that “O beautiful for spacious skies” thing going, too. The annual pig roast is hosted by Sabroso, one of the most convivial restaurants in the state, hidden in a glade over a small bridge on the edge of Arroyo Seco. Chef Tim Wooldridge presides over other food events—a clambake, a paella party—during the year, but the pig roast has become Sabroso&apos;s signature festivity. With my advance reservation for the afternoon meal comes a parking place, a coveted perk on this busy day. The aroma of roasting pork wafts to my nose, and on a custom rotisserie I spot a good-sized pig—one of two Chef Tim’s cooking up for the party. It’s nearly done, all crackling brown skin and glistening meat. I officially check in at Sabroso, and am given a wristband and a beverage. Now it’s time to walk back along the main road to find a spot for the parade. Many in the crowd tote collapsible lightweight chairs for comfortable viewing. For complete story and recipes, click here.